Creating beautiful signs since 1979.
we have a new address -> 11/172 REDLAND BAY RD, capalaba, Qld. If you own or are starting a business, an important consideration is how you plan to use of signs and displays. A professional sign solution can help your business stand out. Potential customers are more likely to purchase from a business they have already heard of, know, like and trust. A sign can raise awareness of your business, leading to future sales. We love to help! You will reach a real person. If you get Lyn on the phone, she may be the nicest person you'll ever have talk to. If by chance you reach Bill, you'll be talking to one of the most knowledgeable characters in the printing and signage industry. We would love to help you. Signs help sell and represent your business. A considered sign can draw attention to your location and may assist to differentiate it from others on the street. Interior signs help customers navigate stores, find the right products and services and can lead to extra sales when added to specials. Signs often are the first link between a business and its customer. Signs may be designed for exterior applications; long-life span, tough, durable items. Signs may be temporary, simple items, designed for an event. Its always good to get the right advice. At Display Craft we look at providing the right solution fit for the application. That’s why we have so many different types. The right signs can also be effective off-premises. Strategically placed billboards still have a place in the market. Magnetic signs or whole car-wraps are extremely popular and are your mobile billboards. Some businesses pay other motorists to install signs on their own vehicles for additional reach. Applications for signs are only limited by your imagination. Branding via the use of a logo creates further awareness and familiarity of your business. Using your signage to help people navigate, by having street numbers, can add much value, by reducing frustration. People appreciate the care taken to include these simple, cost effective details. If your signage strategy & design considers your end user and their needs, it will be a success. There are many things to consider and the friendly staff at Display Craft are here to help. For those looking for the best ROI from your marketing budget, signs can be an effective form of marketing and advertisement. Research suggest that the “cost-per-thousand”, a method whereby you measure the cost of reaching a thousand potential customers, can be lower for signage than other types of advertising, such as radio, televisions and newspapers or the internet. Signs can be an essential component of a business’s go-to-market strategy. A good use for signage can be to draw attention to specials and promo’s. Or to convey information and updates about your business. Because an exterior sign can be visible 24/7, 365 days a year, it may be particularly beneficial. At Display Craft we use the premium technology, fit for purpose. The Japanese Mimaki JV400 printer is one example of the technology we have access to. With a world’s first latex white ink. Latex white ink realizes the natural vividness of colours by being used as a ground to print on uni-coloured and transparent or coloured materials. Contact us for your printing needs and we will be able to assist. The Advantage of White Ink: The Mimaki JV400LX printer are the first latex printers with white ink. The addition of white ink opens up a number of design possibilities when printing on coloured vinyls, clear window films, reflective sheeting or metallic films. After printing a base layer of opaque white, you can print coloured images on top of it. The white blocks out where the image is, leaving the coloured or metalized media as the background. 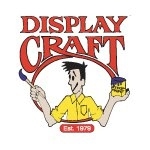 “The team at Display Craft are friendly, knowledgeable and committed to providing the best service for any job. Bill has been happy to discuss every job with me, helping me better understand the options available to best suit my requirements. Every job has been delivered on time and to the highest standard, no matter the location or size ." Display Craft™ is a versatile screen-printing, songwriting and digital printing company established in 1979. We specialise in point of sale (POS) signage, LED signs, Corflute, self adhesive vinyls, sign-white metal signs, digitally & screen printed fabrics, banners, magnetics, self standing displays, printing on plastics, installation of signage, office signage, shop fronts, window graphics, vehicle decals, vehicle wraps and much much more! Feel free to contact us for a quote on your next job today. We are always keen to assist where we can.